Miliband: "Harassment and intimidation of a kind which is quite unacceptable"
TEHRAN, Iran (CNN) -- The arrest of local staff members at the British Embassy in Iran is "harassment and intimidation of a kind which is quite unacceptable," British Foreign Secretary David Miliband said Sunday. 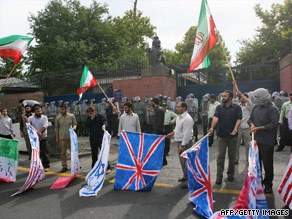 Iranian students protest outside the British embassy in Tehran on June 23. "About nine" staffers have been affected, he said, adding that some had already been released. "We have protested in strong terms directly to the Iranian authorities about the arrests that took place yesterday," but there has been no response, Miliband said. Iran's government-backed Press TV said earlier on Sunday that eight local British embassy staffers had been seized for their role in the unrest following the disputed presidential elections on June 12. Last week, Tehran expelled two British diplomats. London responded by booting out two Iranian envoys. Iran then recalled its ambassador to Britain, saying it would reconsider its diplomatic ties with the United Kingdom. Withdrawing an ambassador is a very serious gesture in diplomatic circles. The Iranian government has long accused other countries, especially Britain, of "meddling" in its affairs, but has offered no proof any outside forces have been involved in the unrest since the election. On Wednesday, Iranian authorities said they had arrested several foreign nationals, some with British passports, for allegedly helping foment the disturbances. Miliband rejected the allegation on Sunday. Meanwhile, the Iranian government will allow a demonstration at Tehran's Ghoba mosque Sunday, CNN has confirmed. The gathering is officially meant to honor Mohammad Beheshti, a hero of the 1979 Islamic Revolution who was killed in a bombing on this date in 1981.